On the evening of Friday, December 15th, at The Church of the Transfiguration aka “The Little Church Around the Corner” in New York City, we were treated to a delightful Christmas program. The Church is both magnificent and simple, spacious and intimate. A perfect setting for a pre-Christmas feast. 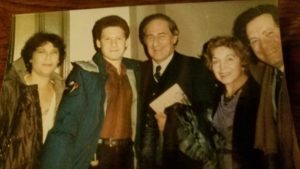 Renowned Brooklyn born Arnold Schwartz (1905-1979) was a great patron of this Church and the Candlelight Concert was a memorial to his revered philanthropic deeds. 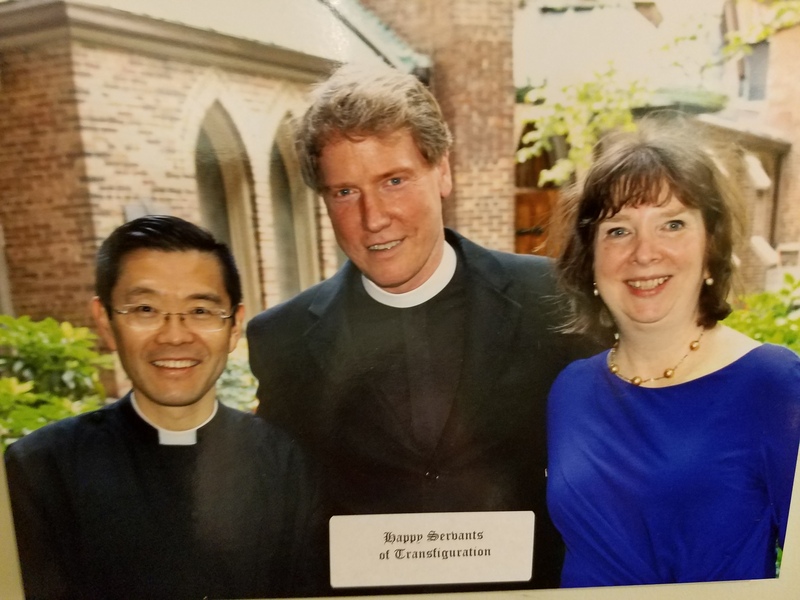 His wife, Marie Schwartz continues his ongoing generosity. The Reverend Father John David van Dooren spoke with great enthusiasm for this special concert and his particular fondness for Gian-Carlo Menotti’s masterpiece about to come. This concert was in two parts. 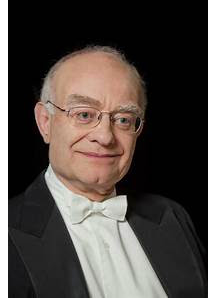 The first, Dancing Day was by British composer John Rutter, born in 1945. Mr. Rutter is a composer of note and renown who feared that people would recall him only for his Christmas output and ignore his more prolific works. Coincidentally, The New York Times featured this composer and his dilemma in a recent article. Dancing Day is a cycle of carols. The piece begins with a harp solo Prelude, by the prodigiously talented Kathryn Andrews. Her playing throughout was exciting and exemplary. Angelus ad Virginem and A Virgin most pure was sung with stellar soloists Ambar Rosario, Enlun Yin and Tessoro Estrella. Next was Personent hodie followed by an exuberant and mighty harp solo by Kathryn Andrews and There is no rose with sparkling soloists Katie Puschel soprano and Joe Redd alto. The Coventry Carol was followed by Tomorrow shall be my Dancing Day beautifully sung by Emely Perez. The choir director and conductor was Dr. Claudia Dumschat who led the singers with unity and abandon. The “Dis, dis, dis” and “Goos, goos, goos” were sung as the golden harp took us to the world of the magic and sanctity of John Rutter’s Christmas! I found Goldie Gareza listed among the tenors, her dark impressive mezzo well suited to her being a female tenor as well. The Transfiguration Choir of Men and Boys and the Lumines Girls Choir were true messengers of John Rutter’s Christmas spirit! The soloists sang with ease charm and dedication in clear and heartfelt joy. Kathryn Andrews played piu forte and we were now eager for Amahl and the Night Visitors. A beautiful warm up before the main course! Composer Gian-Carlo Menotti’s (1911-2007) Amahl and the Night Visitors unfurled and thrilled. 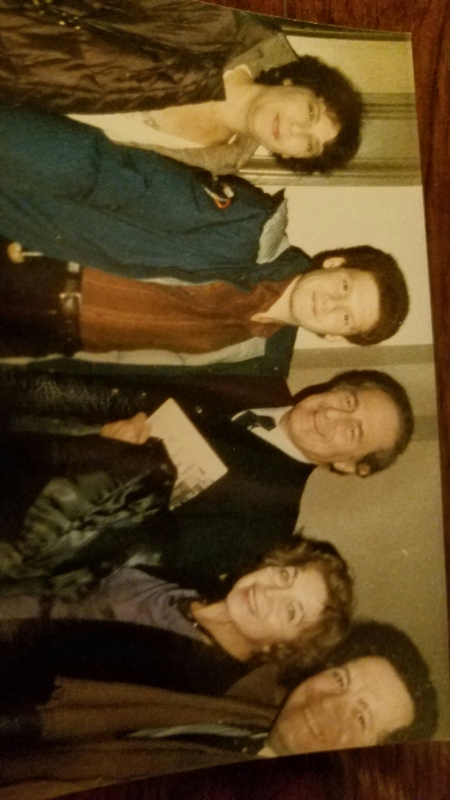 Menotti was commissioned by Peter Herman Adler, director of NBC television’s new opera programming, to write a Christmas opera. Menotti was perplexed by this sublime challenge as the months went by. 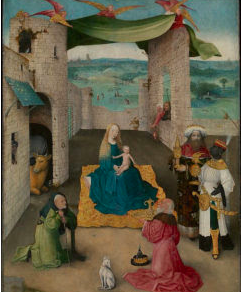 While visiting the Metropolitan Museum of Art one November day, he chanced upon the Hieronymus Bosch painting of “The Adoration of the Magi.” Recalling his youth in Italy, awaiting the Christmas gifts with his brother by the Three Kings, the opera came to him. It was completed just in time and was such a hit that it was repeated for many years. The great Arturo Toscanini who conducted the NBC Symphony for 17 years, told Menotti with great emotion, that Amahl was his finest work! It was first seen on television on December 24, 1951. My father Santo, who was a hard working man, but knew little about opera, told me, a young opera lover and tenor, how much he enjoyed this opera after seeing it on television. Maestro Dr. Claudia Dumschat, with the Transfiguration Choir of Men and Boys and the Lumines Girls Choir and Camerata and the 15 piece orchestra, were now ready for this timeless masterwork. It was written when TV executives in those halcyon days of yesterday, wanted their audience to have the best of classical music. Today, it seems to be the opposite, where like Christmas, the very word “classical” is treated with indifference as something obsolete! Amahl’s Mother tries to steal some of the gold (“All That Gold”) when the Kings are sleeping but is caught by their Paige. Amahl fiercely defends his mother who wants to return the gold to the Kings. The Kings tell her that the Child they seek will not need their gold. His life will be based on love. Amahl offers his crutch as a gift to the child. Suddenly, a miracle occurs and he is walking and kicking up his heels! He runs up and down the aisles and trips just once. The Kings ask if they can touch him and he lets them. When the Paige asks also, Amahl says “Well, I don’t know if I will let YOU touch me,” but relents and says “alright!” when his Mother scolds him. Amahl is asked by the Kings to join them on their journey to follow the star and find the Child they seek. Amahl and his Mother sing a touching duet and the opening theme is repeated as they fade away. The role of the Mother was brilliantly sung by Jodi Karem whose powerhouse soprano was overwhelming in her portrayal. Her singing in duet with Amahl “Don’t Cry Mother Dear,” was tender and her dramatic Puccinian “All that Gold” was superb. Earlier in “Have you seen a child” she reached emotional and vocal heights that set the pulse racing and the emotional barometer practically bursting. She tapered her volume to blend richly with her Amahl and sang with passion in her arias. Ms. Karem is truly a gem! 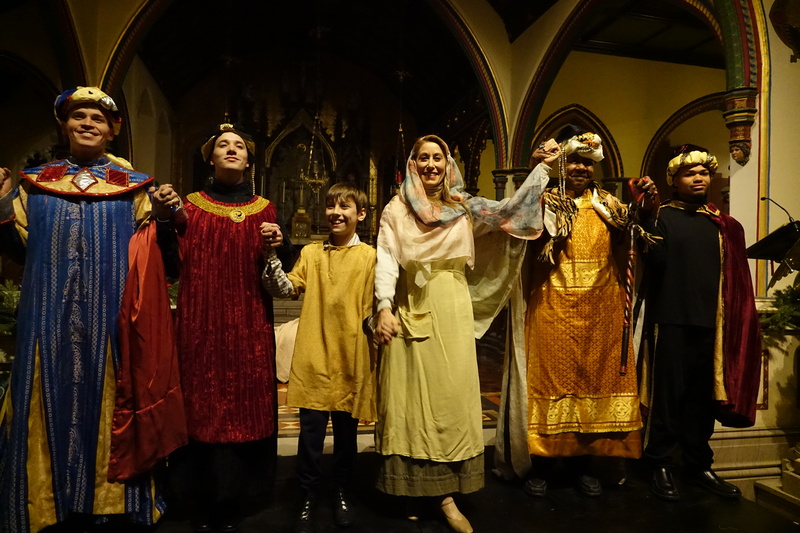 Amahl, played by 11-year-old Luciano Pantano, was also as good as it gets! He is grandson to Judy and myself, his parents are Marcello (drummer) and Tatyana (Russian – Chorus Conductor). His Russian grandparents Nikolay and Lubov teach bayan (Russian accordian) and chorus in Omsk, Russia. I was a boy tenor in Bensonhurst and Judy sang “The Shepherds Chorus” from Amahl at her college choir in California. Luciano Pantano seems to be an amalgam of all these gifts. His beautiful treble voice gained in power, his acting from faces to heel kicks were notable and unforgettable. His “shepherd/sheep” song was poignant, his duets with his mother, “Don’t cry Mother dear” touching and he made for a dynamic and crutch worthy Amahl. Luciano’s running down the Church aisle and doing two impromptu heel kicks were worthy of Fred Astaire and Gene Kelly. King Kaspar, Ben Thomas was captivating. His bird (parrot) has more bite than sprite and his hearing is not so good. His joyous shouts of “Lovely, lovely, lovely” were happily hurled to all and his powerful tenor and befuddled antics were a source of much theatrical pleasure. King Kaspar’s robust and clarion singing of “This is my box” with all his gems was one of the highlights. King Balthazar was made into a noble whole by the rich voiced bass-baritone of veteran Charles Samuel Brown whose regal countenance was always infused with dignity worthy of royalty and whose insightful inner spirit was the fuel on the journey toward the Child. The Paige, Alexis Cordero is 18 years old and a ten year singer with the choir. 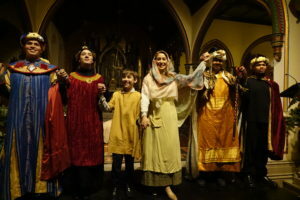 He sang and acted his part with a powerful bass and we enjoyed his wanting to touch the miracle child Amahl. The choir, which includes our lovely grand daughter Leeza, beautifully sang “The Shepherds Song” or “Emily, Emily, Michael, Bartholomew,” with elan and fullness, all in peasant costumes. The dancers, Ambar and Charles Rosario, Savannah Spratt and Mark Willis were graceful and lively, giving us many memorable moments and regaling us with their grace and stylish movements. The superb colorful costumes by Terri Bush were a source of delight. Jesse Obremski was the choreographer who made the audience aware of the high quality peasant dancing. Stage manager Betty Howe had several venues to fill and each one was where the action sparkled with balance and precision. Richard Olson was the Director who brought out the nuance and sadness into a full portrait masterpiece. He is also husband to Claudia Dumschat. Maestro Claudia Dunschat transformed notes and desires into vital reality and gave us a unified performance of harmony and balance. It made the Church of the Transfiguration (The Little Church Around the Corner) that snowy Christmas evening, a place of magic with the peace and love so needed in the world in the form of a perfect singing ensemble sustained by a superbly fulfilling orchestra and a sublime conductor. Blessed are the peacemakers for theirs is the Kingdom of Heaven! And blessed be these “peacemakers” for bringing the magnificent talent of Gian-Carlo Menotti back to a world that thirsts for the beauty and love and the message Amahl offers. The SRO audience responded with great enthusiasm. The reception afterwards was fun to meet and greet with something sweet was in itself a Christmas treat that couldn’t be beat! Bravo to all!